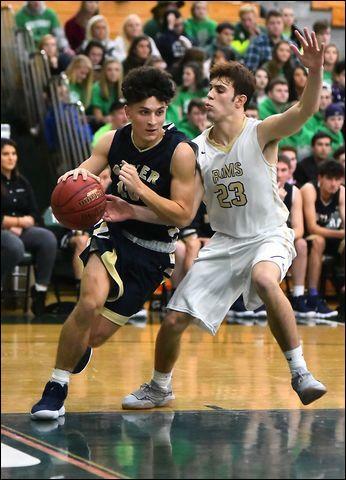 Butler's Tarik Taoufik (10) drives past Highlands defender Luke Cochran to get to the basket during the Golden Tornado's season-opening 75-65 victory Friday night in the Pine-Richland Tip-Off Tournament. PINE TWP — From certain defeat to stirring victory? For Highlands, almost ... until Ethan Morton and his Butler teammates said no Friday night in the first round of the Pine-Richland Tip-Off Tournament. The Golden Tornado watched a 20-point lead early in the third quarter evaporate to a one-point advantage with 4:16 to play. Butler righted the ship and came away with a 75-65 boys basketball victory. “We bent, but we didn't break,” Butler coach Matt Clement said. “Was this a perfect game by us? No. But it was a learning experience against a very hard-nosed team. The Tornado never trailed in the game and had a 39-19 lead after a Tarik Taoufik lay-up seconds into the third period. The rout appeared to be on. Highlands turned it on instead. The Golden Rams sank seven of 28 shots in the first half. They hit 11 of 17 during a 28-point third quarter. “We came out and played timid in the first half,” Highlands coach Tyler Stoczynski said. “That's why we were missing all of those shots. A 3-pointer by Luke Cochran — his sixth of the game — pulled the Rams within 59-58 midway through the final quarter. Highlands regained possession of the ball with a chance to take the kead. Morton stole the ball, drove to the hoop and scored with 3:25 left. He added two free throws with 3:05 to play for a five-point Butler lead. A pair of lay-ups by Taoufik — off assists from Morton — were followed by two Morton free throws, That completed a 10-0 run and gave Butler a 69-58 lead with 1:43 to play. “Those lay-ups by Tarik off feeds from Ethan are what salted away this win,” Clement said. “Tarik was 6 of 6 from the field and that's we need. Morton wound up with 35 points, 10 rebounds, seven assists and four steals. Taoufik had 12 points, Luke Michalek nine points, eight assists and five rebounds. “Not only do we need Ethan to make big shots in key situations, he wants the ball during those times. And he's disappointed if he doesn't make it,” Clement said. Cochran led Highlands with 25 points. Shawn Ercek contributed 14 points and eight rebounds, Johnny Crise 13 points and 11 boards. The Rams out-rebounded Butler 38-29 as a team. Crise is the only returning starter for Highlands. The Rams were 13-12 a year ago. Michalek and Morton are returning starters for Butler. “I haven't seen a guard tandem like this in high school basketball,” Clement said. “This game was faster than our summer games were and our kids will have to learn to finish plays Luke and Ethan will set them up for. The Tornado play Summit Academy — an 81-26 loser to Pine-Richland Friday night — at 11:30 a.m. Saturday to conclude the tournament. Daniel Thimons 1-1 0-0 2, Christian Tanilli 1-4 1-2 3, Ryan Signorella 3-7 2-4 8, Korry Myers 0-3 0-0 0, Shawn Erceg 6-11 2-4 14, Johnny Crise 6-10 1-2 13, Luke Cochran 8-23 3-7 25. Totals: 25-59 9-17 65. Luke Michalek 4-7 0-0 9, John Michalek 2-4 0-0 6, Doug Kostelansky 0-0 0-0 0, Tarik Taoufik 6-6 0-0 12, Luke Patten 1-3 2-2 5, Mason Montag 0-1 0-0 0, Ethan Morton 11-20 10-14 35, Dom Schmidt 0-0 0-0 0, Isaiah Scribner 1-2 0-2 2, Colby Anderson 0-0 0-0 0, Nick Stazer 3-3 0-0 6. Totals: 28-46 18-26 75.